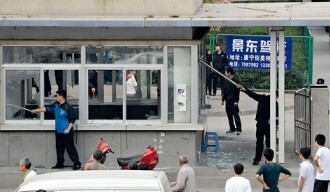 A minor altercation escalated into a full-scale riot at a Foxconn plant in the central Chinese city of Taiyuan late Sunday evening. A spokesperson for the electronics manufacturer said police had to be called in to regain order as production came to halt. Reports are still a bit sketchy at this hour as Foxconn says it all started as a “personal dispute” but eyewitness accounts claim an overzealous factory guard sparked the incident by beating workers. A Foxconn spokesperson told Retuers the plant is closed today for investigation while another worker said the facility could remain closed for two or three days. Photos from outside the factory’s perimeter show broken glass at a security checkpoint. We’re also hearing the area is littered with olive-colored paramilitary vehicles and around 5,000 law enforcement officials were called in to restore the peace. Depending on which report you read, anywhere from 1,000 to 2,000 workers may have been involved. The Taiyuan factory employs roughly 79,000 people that create electronic components for various companies including Apple, Dell, HP and Microsoft. An employee said the plant made parts for the recently-released iPhone 5 although a spokesperson for Foxconn would neither confirm nor deny this allegation. It’s more bad news and negative press for a company that’s dealt with low wages and accusations of poor working conditions for several years. These issues led to a string of suicides that garnered worldwide attention and prompted both Apple and Foxconn to join forces in an effort to improve conditions and pay rates.